When determining what’s possible with a desktop 3D printer, think beyond the build volume. Just as assemblies, such as your smartphone or even a road bridge, consist of many individual building blocks, splitting a model into smaller parts that can be combined after printing is a great solution to creating objects larger than what fits on a build platform. Splitting a part can also be the best way to get a high-quality result, even if the whole part could fit into a single build. This is the case when multiple or opposing surfaces need to be free of support marks, a design has complex overhangs, or a model contains cavities that would trap the liquid resin inside. 3D printing multiple pieces also opens up new opportunities, such as creating multi-material assemblies or combining rigid and flexible 3D printed parts to simulate overmolding. Chemical fastening: Use a bonding agent for art, scale models, and complex shapes that are not meant for functional use and to sustain impact. Mechanical fastening: Add screw thread or pockets to functional engineering parts that require a robust mechanical connection or if you need to repeatedly attach and detach components. This guide will focus on creating large multi-piece stereolithography (SLA) 3D printed models using chemical fastening. Read on for a step-by-step walk through the process, from splitting your model to post-processing for a professional finish. No time to read right now? There are two methods we recommend for splitting models: Add features to your design that will allow the prints to align themselves, or simply split the parts with straight cuts, requiring you to align them during the fastening process. Regardless of which method you choose, if you have a large number of parts it’s also a good idea to add a unique identifier (letters, numbers) to each part to help you solve the puzzle during assembly. Use the CAD tool of your preference to split your model and add basic aligners like slots, pins, grooves, recesses, and lips or more complex aligners like dovetails and cuts that follow existing creases in the model. Adding aligners to a design can help when it comes to assembling parts. In a perfect world these aligners make it simple to align and assemble your parts, but can lead to issues when they turn out even slightly different from your 3D models and don’t line up perfectly. Consequently, only use aligners if your printer can print dimensionally accurate parts that are unlikely to warp. Cutting your model along straight lines is less design intensive than adding aligners. Straight cuts are also more forgiving when prints turn out slightly warped or have generally a higher degree of dimensional variation. Adding identifiers to each part helps you solve the puzzle during assembly. On the downside, straight cuts can be time intensive when it comes to assembly, as you have to manually align each part and make sure they remain in the correct position until the adhesive fully bonds them. By default, the stereolithography (SLA) 3D printing process creates fully dense parts. Depending on your design, this might not be a requirement when printing large objects. In such cases, 3D printing the outer shell or hollowing out your design are great ways to save a considerable amount of material and time. When printing hollow models with an SLA 3D printer, be sure to add venting holes to avoid creating pressure volumes with air and resin. Hollowing out your model can save substantial time and material, as the printer will only need to print the outer shell. Find out more on how to save material and time by hollowing out your 3D models. For the largest parts and the strongest adhesion, use 5-30 minute epoxy. It has the longest work time, which helps when adjusting the position of larger parts, but also leads to an overall slower assembly process. Most 5-minute epoxies won't change shape after about five minutes and reach approximately 75 percent cure strength in less than an hour. For the largest parts and the strongest adhesion we recommend epoxy. The next option is cyanoacrylate (CA, or Super Glue), which creates a quick, reasonably strong bond making ideal for small- and medium-sized parts. Clean the part thoroughly before applying it to the surface, as CA does not bond dirty surfaces well. CA has moderate impact strength, but is not recommended for high-impact applications. For smaller prints you can also simply use the liquid resin from your 3D printer. Pour a small amount of resin into a tray from the bottle or cartridge, use a dropper or syringe to pick it up, and place it onto the surface to bond. Join the parts and wipe off any excess resin that might spill out around the edges. To solidify the resin and bond the parts, use a 5mw UV laser light pen (405nm wavelength) and direct it to the bonding area around the parts. This method will create a chemical bond, just as if the part was printed on your SLA 3D printer, but is only applicable to small bonding surfaces as the low power light pen cannot penetrate the model deep enough to create a strong bond. Note: When dealing with resins, make sure to wear protective equipment including appropriate eye protection and gloves. Now that you’re finished assembling your model, the final step is post-processing. This step consists of geometric correction of the part to ensure it has an even surface true to your original 3D model and aesthetic finish to get a consistent painted surface. Depending on the accuracy of your printer and the size of the printed parts, it’s almost inevitable to have slight voids or incorrections where the parts meet. Automotive putty (such as Bondo 907) sticks to the resin well and should be applied to the surface in thin layers to patch these inaccuracies. Sand lightly after each layer dries to help bring the part towards its final form. Patching parts with automotive putty (red area on the image) will help you mend slight voids or incorrections in between parts. Sanding will help you remove support marks and any remaining inaccuracies from your model. Start with carefully dry sanding the surface using ~150 grit sandpaper to remove large support marks and level the edges where parts meet. Once the part’s surface is even, wet sand it with ~320 grit sandpaper to remove all remaining layer lines. Move the sandpaper in a random motion to avoid creating a grain. In most cases these two steps will create a smooth enough finish, but you might continue increasing the sandpaper grit count by a factor of ~2 and wet sand the entire part until the surface reaches the desired smoothness. Power sanding works best on large flat surfaces, but can easily destroy small features. For smaller parts we recommend manual sanding, for larger ones a combination of manual and power sanding. For larger parts, a combination of power and manual sanding can save you considerable time. Power sanding works best on large flat surfaces, but can easily destroy small features, sharp corners, and the subtle contours characteristic of SLA printing. Power sanding also creates a lot of dust, so make sure to prepare the surrounding area. Note: Power tools require your full attention and wearing protective equipment. It is very easy to leave the sander stationary and quickly wear down that area without realizing it. Once you’re finished sanding your model, rinse it in soapy water to remove any dust or debris and dry it thoroughly before moving onto the last step. Priming ensures paint adhesion to the surface and can alert you to where you may need to sand more or trim support marks you may have missed. Generic plastic primer in matte grey shows details exceptionally well—apply it to the surface in several thin coats for the best results. Continue sanding on critical areas, apply a light coat of primer again, and repeat this process until the full part has an even surface. Note: When priming and painting, wear protective equipment including a respirator designed for paint fumes. Generic grey primer shows details exceptionally well and will help you uncover spots where additional sanding is required. Find out more about sanding and priming from our extended guide. For a finish with multiple colors, you’ll need to mask your model. First, plan the order in which you will paint your model depending on the color, opacity, and size of the area that will have the specific color. Start with the smaller parts so you’ll need to cover less when painting the bulk of the area with the main color. Use painter’s tape for covering the edges and corners, and sheets of paper to cover larger sections faster. 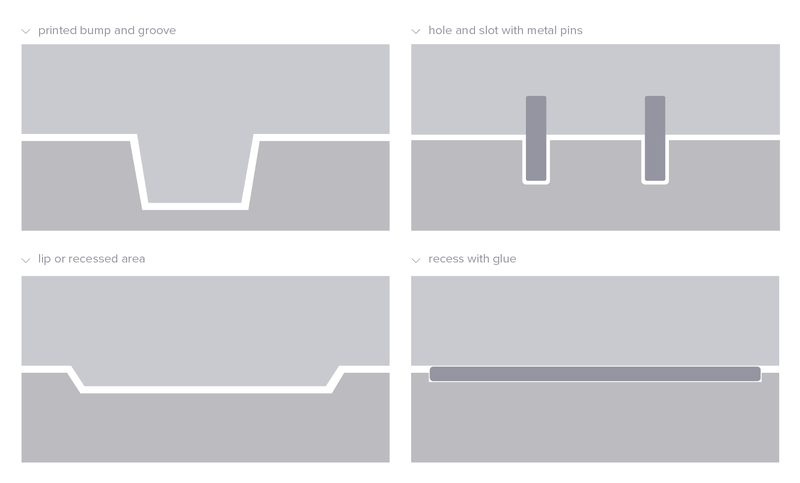 Tape guides (lasercut) can also be helpful to create clean lines, circles, and complex shapes. When it comes to masking, figuring out the correct order is your first priority. In our case, the parts were first painted silver and the sections that would remain silver on the final part were then covered with painter’s tape to hide them from the next layer of paint. Just as with priming, apply several thin coats rather than one heavy coat for the best results. Most spray paints work best in warm, slightly humid, and not windy conditions, but always check the specific paint can or technical documentation for the manufacturer’s recommendations. Consider the time the paint takes to dry: Let layers sit before applying the same color and allow the paint to dry fully before applying a new color. The area we covered with painter’s tape remained the original silver color after its removal. &hellip;Wondering what happens when all these pieces come together? Formlabs Optical Systems Engineer Adrian Tanner 3D printed this R2-D2 replica consisting of 105 3D printed pieces on a Form 2 SLA printer. It even has working electronics inside, borrowed from the Form 2 — the galvo drivers to make the sounds, the cartridge dispenser for lights, and the Z axis driver for the dome motor. Visit our materials page to learn more about Formlabs Resins, and request a free sample part to experience SLA quality firsthand.